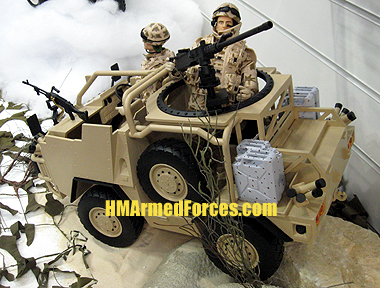 The toy HMAF M-WMIK Jackal is largely based on the real vehicles currently deployed in Afghanistan. The Jackal is a four wheel drive all terrain patrol vehicle with phenomenal firepower, speed and agility. Equally comfortable off road, this HMAF vehicle sports a 5.9 litre engine and is capable of speeds of 80mph on the tarmac. The toy version comes complete with camouflaged Jerry Cans used for both fuel and water. Incredibly, the jerry cans on board the real Jackals are capable of withstanding bullets. The Jackal is also known by its acronym M-WMIK or Mobility Weapons Mount Installation Kit. The Jackal is being deployed in Afghanistan as a replacement for the more lightly armoured Land Rover. 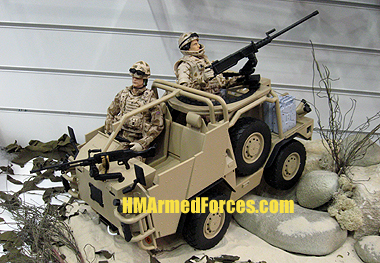 In service these rugged new HM Armed Forces vehicles are crewed by a team of three armed with a .50 calibre machine gun, automatic grenade launcher or 7.62 General Purpose Machine Gun (GPMG) with a second 7.62 GPMG for the Commander.